As Griffith Company’s Chairman of the Board, Tom Foss provides a vision and direction for the Company’s management team and employees. His four-decade tenure at Griffith Company began in 1978, the year he joined as a laborer. Over the next few years, Tom transitioned from a foreman in the field to an estimator in the office. By 1986, he was the Chief Estimator for the Orange County District, participating in many of the District’s key projects. After a stint as Vice President and District Manager in Orange County, Tom was selected to oversee the Company’s operations. One of several top management team members to come from the Orange County District, Tom was instrumental in developing the Company’s project management strategy, which has garnered industry recognition as well as successful results. And, in true Griffith Company tradition, Tom leaves a legacy of industry activity. 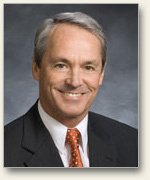 For AGC of California, he has chaired the Highway Division, served as Chairman of the Orange County District, and provided leadership as the 2008 AGC California President. He also served in various capacities including liaison committees with Caltrans and LA Metro and serving on the Board of the Construction Industry Advancement Fund. His greatest industry achievement is helping to create Southern California Partnership for Jobs, a coalition of management and labor that advocates for infrastructure improvement, to better the lives of millions of Southern Californians.